As compared to the “BIG FIVE” manufacturers of Carnival Glass, it could be said that Cambridge contributed little. In fact not many people associate Cambridge with the production of Carnival Glass. 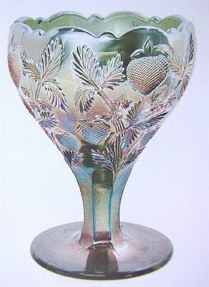 Mrs. Kamm, one of the early writers even states in Volume Seven of her pattern glass series that, “Cambridge never made any Carnival Glass.” The fact is, however, they got into the act in a major way even though their principle line was always fine crystal and non-iridized tableware. The Cambridge Glass Co. sprang from a conglomerate of some nineteen glass factories in 1898 which was called the National Glass Co. A few years later and after a new factory was built at Cambridge, Ohio, they took on the Cambridge name by which we have known them for so many years. Orrie Mosser was the plant manager for Cambridge Glass. In 1906 they adopted the “Near Cut” trade-mark. Most, but not all, of their Carnival production carried this logo. For several years prior to 1906 they had used a “C” in a triangle. The company was in continuous operation until 1954 when they ceased operations and their molds were sold to the Imperial Glass Co.
Today, there remains: The Cambridge Glass Museum where crystal and rare pieces of Carnival are on display. Tom Mosser, Orrie’s son, went to work for Cambridge Glass as a teenager with glass in his veins, so to speak. Following the Cambridge closing, Tom spent his spare time and money gathering up old molds and equipment with hope and planning towards a glass operation of his own. Most of the glass operations in the Ohio-WV area descended from and through families who had made their livelihoods from that manner of employment. By 1959, Tom Mosser opened his business in an abandoned chicken coop. (Corporate tycoons: take note! It’s called “starting from scratch”~~ a hillbilly term for making “filthy lu’cre ” without stealing from others or obtaining a gov’t. “small business loan”)………..Old fashioned, is what it really is. (However, it IS INGENUITY at its finest hour~~what this Country was built upon). With this brief history, let’s now take a look at the various Cambridge patterns that were used for their Carnival production. The known shapes and colors will be listed. No pastels have been reported. Marigold, green and purple were the standard colors used with a blue piece turning up now and then. This is, no doubt, the most famous and most popular of the Cambridge patterns. 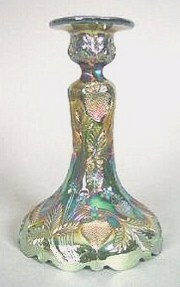 It was used for a wide range of crystal as well as the Carnival items listed here. Giant Compote: Known in marigold and purple. One of these has not turned up for sale in a long time. The marigold seen in photo with the powder jar and marigold candlestick was seen in the Cambridge Museum 4/15/04. Table Set: marigold, green, purple and blue. These pieces are all rare and a complete set is seldom seen. Spittoon: marigold, purple, blue and green. These were not whimseys but a very limited production line item. Seldom offered for sale. 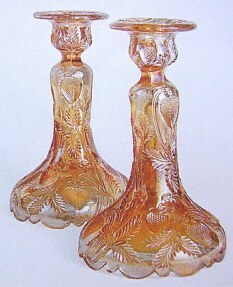 Candlesticks: 7” tall in marigold and green. Powder Jar: marigold piece but also the easiest to find. (Note the green base as seen in the Museum 4/15/04. This is the only dresser item in this pattern. Berry Set: marigold, purple and green. A complete set is seldom seen. Its desirability is lessened by the fact the pattern is on the exterior only. This makes these bowls difficult to display effectively. Ruffled Bowl: from large berry size bowl. Tall Compote: marigold having a straight top edge, the green showing a somewhat cupped edge.It stands 6” high and is just under 5” in diameter.). There is also one of these in marigold with a ruffled top. Celery: blue. I have seen a number of these in pressed glass but only one example in Carnival. Jelly Compote: blue and amethyst. This is one of the two that we have learned about. It stands 3 ½”tall and is a miniature version of the giant compote shown in At one time it was thought they might have been designed as a berry set. This appears unlikely, however, since so few of the small ones have turned up. 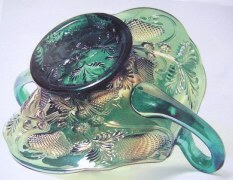 This small size was made in pressed glass and came with six miniature cups as a child’s punch set. 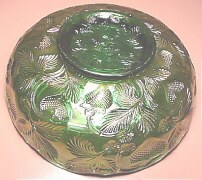 Rosebowl : This lovely piece was shaped from the large berry bowl. Amethyst. Stemmed sugar & creamer or Breakfast set: blue and amethyst. Very rare. 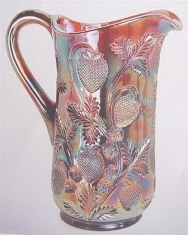 Milk Pitcher: Only six or eight are known in purple. UPDATE: Since so little Cambridge carnival glass is sold at auction, we want to provide our viewers with some recent figures realized from the Pritchard collection which sold in April 2004, when Seeck Auctions conducted the sale for HOACGA Convention. Green Inverted Strawberry Spittoon - roughness on the edge. $295. 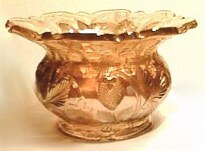 Marigold Inverted Strawberry large size round compote, signed Nearcut. $325. Amethyst Inverted Strawberry tankard water pitcher~bottom marked NEARCUT. $1350. 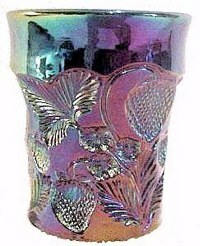 2 purple Inverted Strawberry tumblers (both contemporary). $15.ea. (IF those had been of vintage variety, the price could have been 10 times or more higher. INVERTED STRAWBERRY Berry Set in Marigold. Quite Unusual. (NEAR CUT) - 9 inch Master Bowl, 4.25 inch Small Bowls. 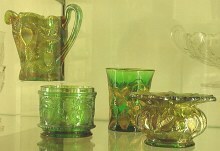 Green creamer, powder jar base, tumbler and Spittoon as seen in Museum showcase on April 15, 2004. Amethyst creamer and rosebowl-inside museum showcase. Spittoon without a tight pinch. 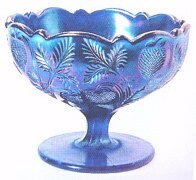 Spooner in blue-there is one in the Museum. Taken through showcase glass at Cambridge Museum. 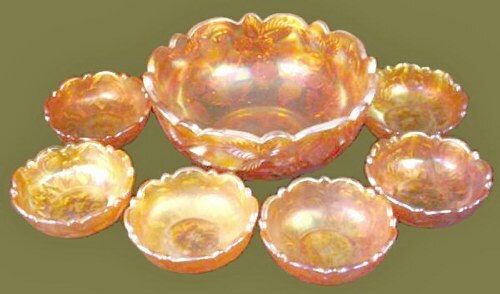 Rosebowl shaped from large berry bowl. 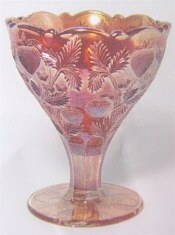 This purple INVERTED STRAWBERRY Tumbler, said to be marked Near Cut on the inside bottom is 3.75 in. tall x 3.25 in. across the top. It appeared For Sale on eBay 3-9-05. Old or repro.--Good Question. 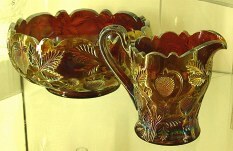 The tumblers in this Inverted Strawberry pattern have been heavily reproduced in many colors in Carnival by Hansen, Bennett, Westmoreland, Crider and Guernsey. They are all signed, however, by these various makers and should cause no real problem for collectors. About 30 blue pitchers were iridized in 1972 by Guernsey and an additional 100 purple in 1977.These pitchers are smaller and shaped much differently than the old tankard which makes them easy to spot. INVERTED STRAWBERRY, (Contemporary) - These tumblers (scream SHINE), in the words of Bob Smith! He also says that the square designs around the berries are somewhat more distinct than on the vintage examples. Colors of green, amethyst and marigold are fairly accurate, but the blue has a different tonal quality. 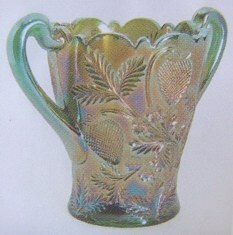 Vintage tumblers in the INVERTED STRAWBERRY pattern have no iridescence on the base. Sizes vary somewhat in height, both in Vintage examples and the Contemporary. Green, amethyst and marigold are similar to the shades used for the newer tumblers, but the blue is noticeably more intense. All photos courtesy Bob Smith.